Thu., July 19, 2018, 6:01 p.m.
SAN DIEGO – With an eye on October and beyond, the A.L. 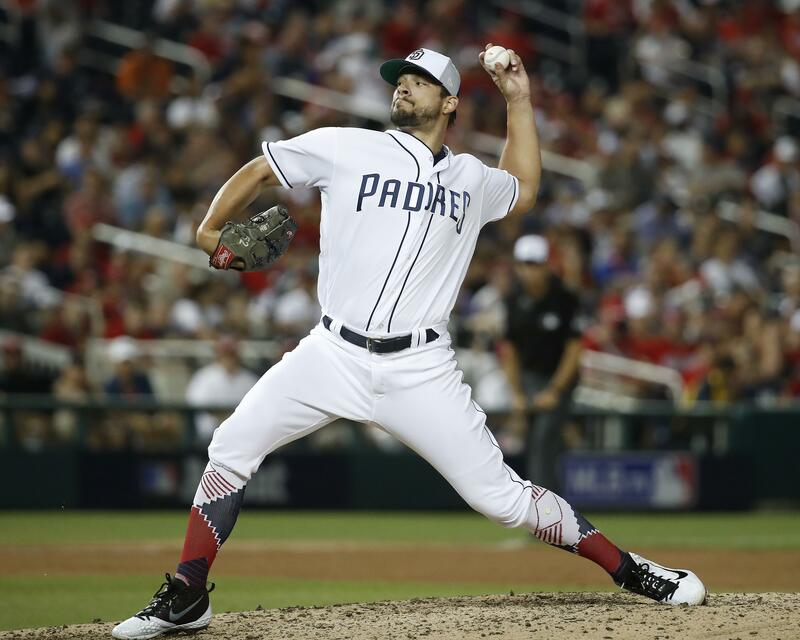 Central-leading Cleveland Indians scooped up All-Star closer Brad Hand and fellow reliever Adam Cimber from the rebuilding San Diego Padres in exchange for switch-hitting catching prospect Francisco Mejia. The Indians need Hand, a lefty, and Cimber, a rookie right-handed sidearmer, to shore up a bullpen that has been without left-hander Andrew Miller since late May and has a 5.28 ERA, second-worst in the majors. The trade was announced Thursday, well ahead of the non-waiver trade deadline. The Indians lead the A.L. Central by 7 1/2 games over Minnesota. After losing Game 7 of the 2016 World Series to the Chicago Cubs, the Indians returned to the postseason last year but lost in the division series to the New York Yankees. Miller, Cleveland’s two-time All-Star reliever, has been on the disabled list since May 26 with an inflamed right knee. He’s on a minor league rehab assignment and Antonetti said his most recent outing was encouraging. Cody Allen has 20 saves in 21 chances for the Indians. Miller and Allen will be eligible for free agency after the season. The Padres claimed Hand off waivers from Miami early in the 2016 season and he developed into a two-time All-Star. Known for his slider, he has 24 saves in 29 chances, with a 3.05 ERA and 65 strikeouts. Antonetti said the Indians have had an eye on Hand for more than a year. Hand was on the trading block last year but stayed put. Some teams felt San Diego was asking too much for the closer last year, when the Padres finished 71-91. The Padres gave Hand a $19.75 million, three-year contract in the offseason, with a team option for 2021. Cimber is 3-5 with a 3.17 ERA in 42 relief appearances this season. Antonetti said manager Terry Francona will decide how the new relievers will be used. The Padres are last in the N.L. West, 14 1/2 games behind Los Angeles. They haven’t had a winning season since 2010 or been in the playoffs since 2006. They’ve been rebuilding since a win-now approach with high-priced veterans flopped badly in 2015. General manager A.J. Preller has built one of the strongest farm systems in baseball, but the big league team continues to flail despite getting its first infusion of young talent late in the 2016 season. Mejia was batting .279 with seven home runs and 45 RBIs in 79 games for Triple-A Columbus. The 22-year-old made his big league debut on Sept. 1, playing in 11 games with Cleveland last year and one game this year. Mejia can also play third base and outfield, but Preller said he’ll focus on catching at Triple-A El Paso. Published: July 19, 2018, 6:01 p.m.